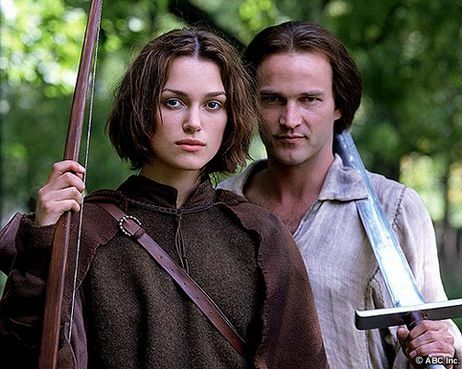 In this Disney "revisionist" spin on the ancient Robin Hood legend, Keira Knightley stars as Gwyn, daughter of fabled medieval outlaw Robin O'Locksley (Stuart Wilson). When her dad is captured by the evil Prince John (Jonathan Hyde) after the demise of Richard the Lionhearted, sweet Gwyn pulls a "Joan of Arc," donning the traditional lincoln green, reuniting Robin's Merrie Men, and working overtime persuading Richard's cowardly son, Philip (Stephen Moyer), to return from exile in France. And oh yes, Gwyn is just as proficient with bow and arrow as her celebrated father (as the film's advertising tag assures, "The apple doesn't fall far from the tree" -- thereby bringing William Tell into the equation). Princess of Thieves originally aired March 11, 2001, as a part of the ABC anthology The Wonderful World of Disney. There's more charm and craftsmanship in the first 30 minutes of Disney's Princess of Thieves than there is in the whole of Disney's Snow Dogs. It was very cute. Kiera Knightly was wonderful, as always, though she is quite young here...a mere 15. A decently made film. Not oscar worthy, but nice to watch. It's not a bad little Disney movie. It follows the same format as most of the flicks that channel puts out.